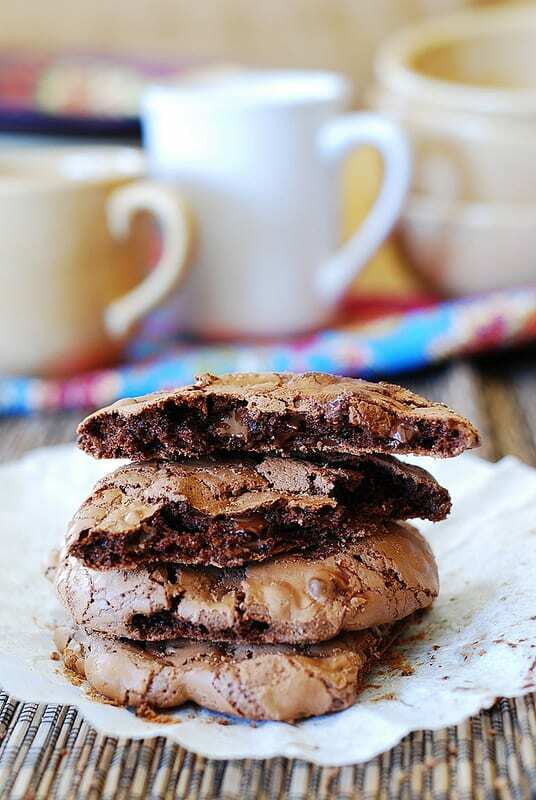 Outrageous chocolate cookies – these cookies are packed with chocolate and have amazing texture! 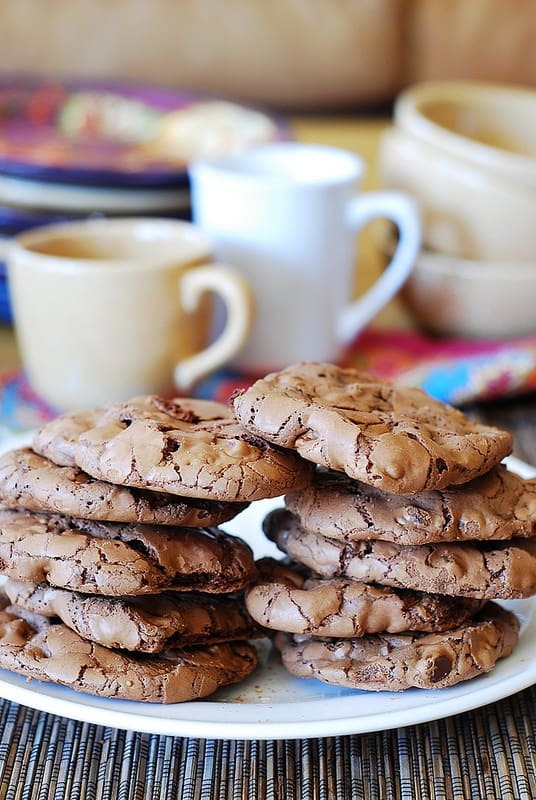 Even though these cookies are very easy to make, you’re dealing with melting the chocolate here, and that could affect your success with these outrageous chocolate cookies. This cookie got multiple raving reviews on Martha Stewart site, but a lot of commentators had issues like having a cookie dough that’s too thin, and, as a result, cookies spreading too flat during baking resulting in not so attractive look (while still tasting good). The original recipe calls for semisweet chocolate chunks, but any type of chocolate chips, chunk, or morsels will work. How to avoid runny cookies? How to make sure the cookies don’t spread too much? What makes cookies flat and how to avoid it? To avoid all of the above, the important thing is not to over melt the chocolate. Melt the chocolate in microwave in 20 seconds increments to keep checking so that you melt it just enough to mix with other ingredients – don’t let the chocolate get too runny. DO NOT OVER MELT THE CHOCOLATE. Melted chocolate should have the consistency of a thick frosting (not a liquid) before you add it to the flour mixture. If it’s too runny, let it cool a little before adding it in. The cookie dough in the end should not be thin. If it is thin, let the cookie dough stand for a while to harden – by letting the melted chocolate harden in the cookie dough. The resulting cookie dough should look like a cookie dough (hardened) and not like a cake batter (runny). Melt the chocolate in step 1 just enough to mix – melted chocolate should not be runny. 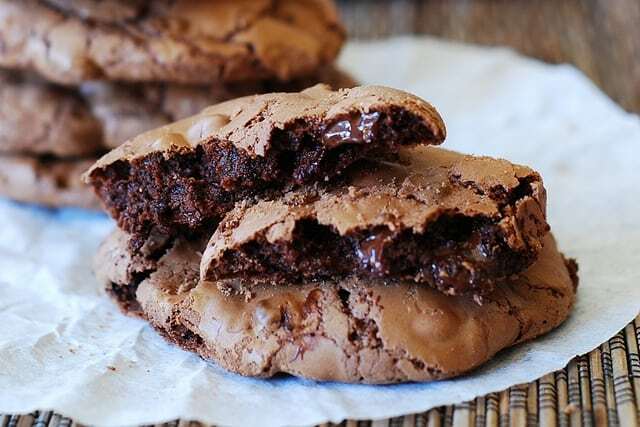 When you mix the melted chocolate in and the cookie dough seems runny due to hot chocolate, allow the cookie dough to cool down for some time to harden up. By allowing the cookie dough sit for a while, the hot melted chocolate will cool down and harden the cookie dough. Beat your eggs and sugar in step 3 really well, until light and fluffy – otherwise the dough will be too thin. Do not over bake the cookie. 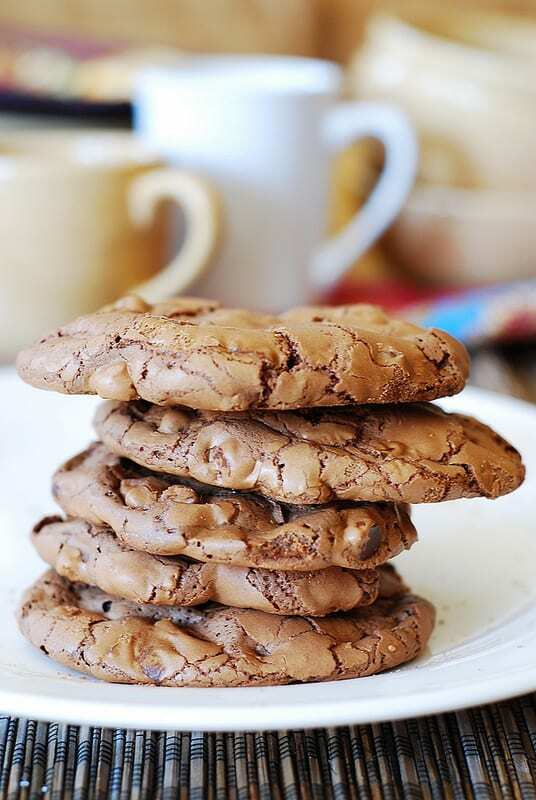 The cookie should not be dry, it should still be soft and brownie-like after 12-15 minutes of baking (no more, maybe less – depends on your oven). To avoid cookies spreading too thin during baking, make sure to follow all of the steps above, and also use cold baking sheets – not hot or warm baking sheets that have been sitting for an hour underneath your pre-heated oven. Storage tip: These cookies keep well for a week in an air-tight container. 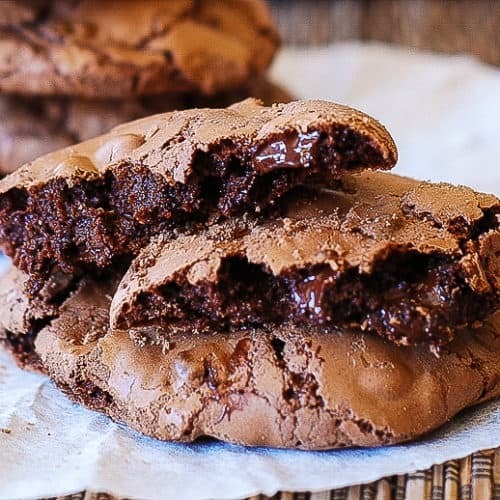 These outrageous chocolate cookies are like small pieces of cake covered in a very thin layer of chocolate. Heat 8 ounces semisweet chocolate chips and butter in a microwave-safe bowl in 20-second increments, stirring between each, until almost melted. Make sure not to over melt the chocolate, melt it just enough to mix – as I emphasized above in the post. In a mixing bowl, beat eggs, brown sugar, and vanilla on high speed really well, until light and fluffy. Reduce speed to low; beat in melted chocolate (remember, the melted chocolate should not be too runny). Mix in flour mixture until just combined. Stir in chocolate chunks (or chocolate chips). If your batter is too runny (due to over melting the chocolate in step 1), let the batter stand for some time to get hard. Spray baking sheets with cooking spray – it’s important: I found that these cookies really stick to the baking sheet if you skip this step. Drop tablespoons (or less) of dough onto cold baking sheets 2 inches apart. Let me emphasize – use cold baking sheets (not hot or warm baking sheets that have been sitting underneath your pre-heated oven). Bake, rotating sheets halfway through, until cookies are shiny and crackly yet soft in centers, 12 to 15 minutes. 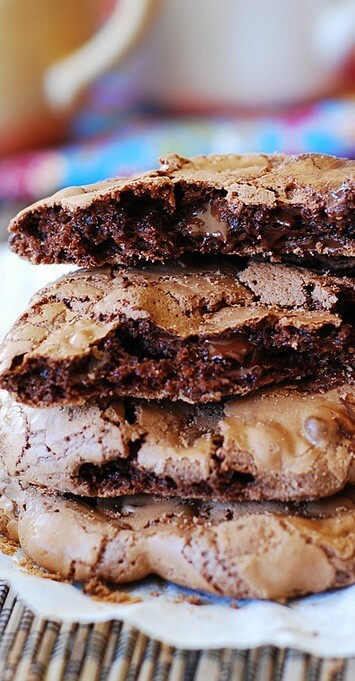 Do not over bake the cookies, the texture should still be soft, that of a brownie, when you take them out of the oven. If you over bake them, they will be too hard. Do not bake them to a crisp, they are supposed to be soft. I don’t see butter mentioned in the directions at all. I’m assuming the butter listed in the ingredients is used in step 4? Sorry, step 3. These cookies are turning out wonderfully, I have to keep the cooling rack out of my daughter’s reach. She keeps stealing them.